You described the charges against the CJN as illegal, saying he ought to be reported to the NJC. If the CJN is taken before the NJC do you think that the outcome will be objective? Since fidelity to the rule of law does not allow the government to resort to self-help, the rights and obligations of every citizen (including the CJN) must be determined in accordance with the law. The government cannot be so much in a hurry to engage in jungle justice in the trial of the Chief Justice or any other citizen. Hence, I had advised the Federal Government to withdraw the petition and refer the case to the National Judicial Council. Until the decision of the Court of Appeal in Nganjiwa’s case is overruled by the Supreme Court the Code of Conduct Bureau is legally obligated to report judges who either made false declaration or failed to declare their assets to the NJC. A couple months ago, the case of the Federal Republic of Nigeria v. Justice Ngwuta instituted by the Code of Conduct Bureau was struck out by the Code of Conduct Tribunal on the authority of Nganjiwa v Federal Republic of Nigeria. To the best of my knowledge the Code of Conduct Bureau has not filed any appeal against the decision. Of course, it is not in dispute that the NJC is headed by the CJN but that does not preclude aggrieved parties from reporting allegations of misconduct against His Lordship to the NJC. If the NJC has to consider any allegation of misconduct against the CJN, His Lordship cannot preside over the meeting or the proceedings in line with the elementary tenet of natural justice which is that he cannot be the judge who will determine his own case. The principle is known as nemo judex in causa sua. Many Nigerians have quickly forgotten that when Justice Ayo Salami, former President of the Court of Appeal, accused the former Chief Justice, the late Justice Aloysius Katsina-Alu, of perverting the course of justice in the appeal arising from the Sokoto State governorship election petition in 2011 the Chief Justice had to recuse himself from presiding over the proceedings of the NJC on the matter. Even though the NJC hastily suspended Justice Salami for embarrassing the judiciary the complaint was eventually resolved in his favour. At the end of the marathon inquiry the NJC recommended the reinstatement of Justice Salami but the recommendation was ignored until the respected jurist retired when he attained the mandatory age of 70 years. It is on record that the Salami/Katsina-Alu imbroglio substantially eroded public confidence in the nation’s judiciary. 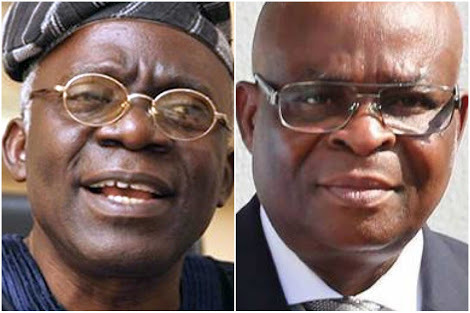 It is therefore interesting to note that the particular political party and members of the legal profession who prevailed on President Goodluck Jonathan not to recall Justice Salami in line with the recommendation of the NJC have suddenly become the defenders of the independence of the judiciary in Nigeria. However, in view of the fact that the CJN has reacted to the allegation in writing the NJC, if given the opportunity, will have no choice but to decide the matter speedily in the interest of the judiciary and the country. Since this is a matter of public interest I have no basis to doubt the objectivity of the NJC in handling the matter. Do you think the charges against the CJN might be a plot by the ruling party to have control of the judiciary against the coming elections? I do not know the basis for the speculation. 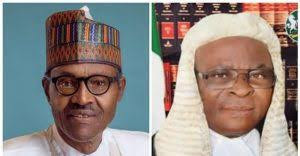 It is on record that Justice Walter Onnoghen, along with Justice Adesola Oguntade and Justice Aloma Muktar, who later became the first female Chief Justice, delivered a dissenting judgment in favour of candidate Muhammadu Buhari in the Buhari/Yar’Adua presidential election petition in 2007. If the ruling party wins the forthcoming presidential election, the Supreme Court cannot afford to annul it. Frankly speaking, the Onnoghen-led judiciary is not ideologically antagonistic to the Buhari administration. In fact, in prosecuting the anti-corruption agenda of the Buhari regime, the judiciary has largely collaborated with the executive. For example, when the National Assembly refused to pass the bill for the establishment of an anti-corruption court the Chief Justice suo motu directed all heads of courts to create special judicial divisions to hear corruption cases alone. The special judicial divisions have been established and they are working in the respective high courts. Even both the Supreme Court and the Court of Appeal have set up special panels to hear corruption matters. No doubt, a couple of important cases have been lost by the Buhari regime in recent time but it is not an expression of ideological disagreement. Ours is not like the Supreme Court of the United States of America whose decisions are largely anchored on political considerations.